This series can get away with the self-aggrandisement. Comedy has followed tragedy in modern Japanese storytelling since its inception. Before Shakespeare was interjecting Hamlet with comedic conversations between gravediggers prior to our discovery of Yorick’s demise—in the grand tradition of the Roman, Plautus, and the ancient Greeks before him—15th Century Japanese theatre was dominated by Noh and Kyogen plays. Noh plays were formalised musical drama often dealing in the supernatural, while Kyogen served as farcical, slapstick interludes between each Noh play in the repertoire. 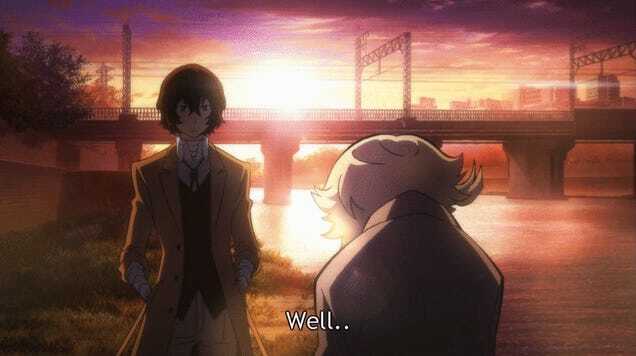 This longstanding theatrical fluidity, of movement between drama and comedy and drama again, may help explain how Bungou Stray Dogs swings between the depths of its protagonists’ despair (starvation, attempted suicide) and making light of it without being tonally jarring. It is not a case of simply adapting the manga either. Director Takuya Igarashi has chosen to wring as much comedic potential as possible from the kernels presented in manga. They are now definite tension releases. Dialogue scenes are often framed in such a way that they wouldn’t be out of place on a stage. Nor would the emphatic use of lighting, and exaggerated expressions, which are reminiscent of Kabuki masks. The slow, deliberate bells that permeate the opening scenes harken back to those dance dramas. In the Bungou Stray Dogs anime, to somewhat inappropriately borrow from a certain English playwright, “all the world’s a stage”. It wasn’t the food, I swear. The juxtaposition of dramatic character interactions, comedy, and supernatural confrontations is common on stage, and by following such cues, it works here as well. The mixture culminates in the series being completely immersive and allows for enjoyment without questioning the world. These changes to the adaptation also seem fitting for a series so steeped in Japanese cultural heritage. The characters are named after some of the most renowned authors throughout Japanese history. Without reading their works or biographies, it is difficult to say if there are deeper thematic links between the names and character arcs, but given the emphasis on books throughout, from Doppo Kinikada slamming down his notebook calling it an “ideal” and his “guide in life”, to the name cards appearing as if they were typed out by a typewriter, it is probable. Not to mention that each character’s power is named after their respective author’s best known work (thank you to Gespy for that piece of knowledge). Those writing connections come to the foreground in the ED, which we unusually were given a taste of. Were their importance not already evident from the episode, the ED gives particular attention to Atsushi Nakajima and Osamu Dazai, the two most complex characters so far. Even at a base level, their contrast is riveting: Atsushi clings to life even as he circles death; Osamu has life, but seemingly seeks death frequently, judging by those bandages encasing his arms. Yet the ED highlights their ties, which, if the nuance in the animation and its perfect synchronisation with the song is anything to go by, will be handled deftly by Bones. In fact, both the OP and ED are high-level productions, further indication of the care with which Bungou Stray Dogs is unfolding. I am immensely looking forward to seeing the subsequent acts and I hope you’ll care to join me. In one line: This is a sterling premiere that balances the dramatic intrigue and comedy skilfully. Please feel free to share your own thoughts, insights, and (hopefully) Japanese literary knowledge in the comments below. 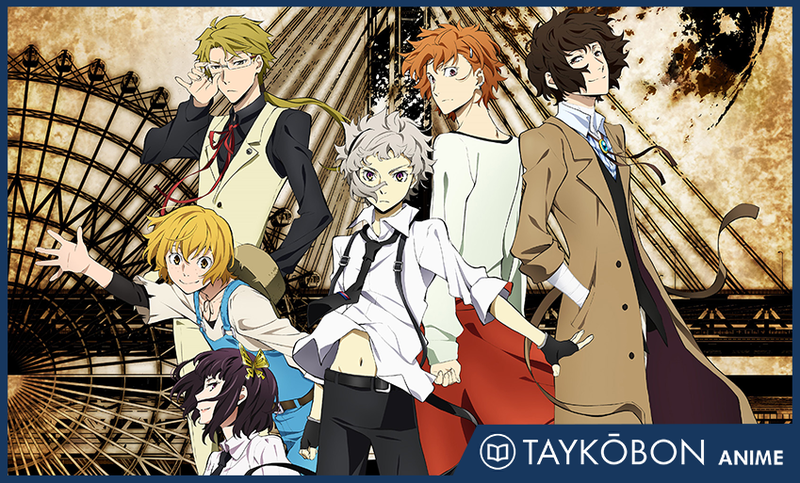 Bungou Stray Dogs is produced by Bones and airing during the spring 2016 anime season. The anime is an adaptation of the manga written by Kafka Asagiri, with art by Harukawa35. The anime is directed by Takuya Igarashi and is scripted by Yoji Enokido. The series will run for two split cours, with the second season debuting in October 2016, with additional OVA episodes to follow.